« Izzy Wells can’t be stopped!! Wolves reclaim that winning feeling!! Bouncing back from its first loss of the season with a vengeance, the Coupeville High School varsity volleyball squad thrashed visiting Port Townsend Thursday in a match in which all 11 players saw major floor time. Two days after falling on the road to King’s, the defending 1A state champs, the Wolves returned home and sailed to a 25-13, 25-14, 25-14 non-league win, kicking their season record to a sweet 6-1. They get a few days off now before traveling to Sultan Tuesday, Oct. 9 to face a Turks squad which is mired in last-place in the North Sound Conference at 0-4. That match will mark the halfway point in league play for Coupeville (3-1), which has sole possession of second-place in the six-team conference. Thursday’s match offered the Wolves a chance to rekindle a rivalry with one of their former mates in the Olympic League, though CHS was not in a charitable mood. 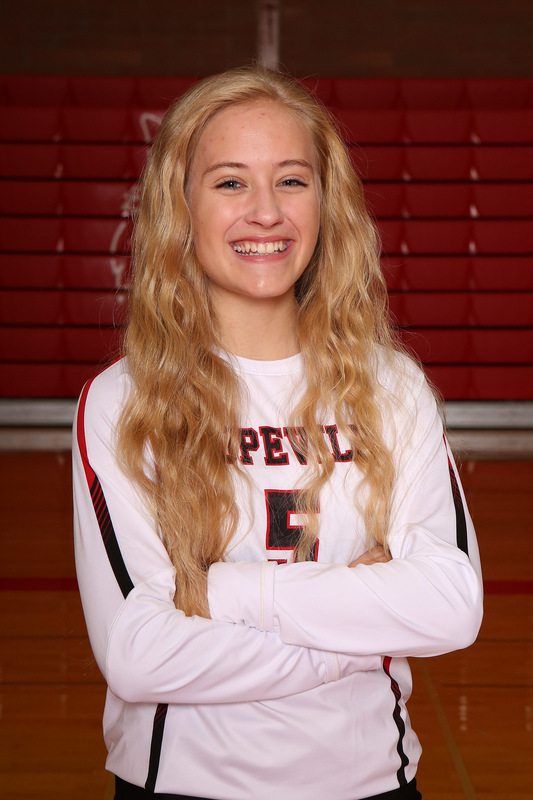 In control from the first serve of the night until the final play, a dazzling hook shot winner thrown down by a suddenly sky-high Scout Smith, Coupeville had plenty of opportunity to experiment, tweak things, and, most importantly, get back that winning feeling. Even better, they did it while getting swing players Lucy Sandahl, Zoe Trujillo, Maddie Vondrak and Raven Vick their most extensive varsity playing time of the season, and all four came through with big plays. Coupeville came out firing on all cylinders, with big hitters Emma Smith and Maya Toomey-Stout torching the RedHawks early with ferocious spikes. With their foes a bit on their heels, the Wolves took advantage, riding a hot streak at the service line from Ashley Menges, who reeled off seven straight points, to blow the lead out to 15-3. Whitmore mixed things up almost immediately, having three of his swing players serve in the opening set, with a Vick bomb setting up a weak return which Chelsea Prescott promptly whacked into the far corner for a winner. The second set was more of the same, with Emma Smith dropping a blistering spike for a winner, in between two plays on which she used her height and leaping ability to soar above the net and flick tips in between defenders. Scout Smith and Menges ran off six points apiece on serve, while Hannah Davidson came bounding out of nowhere on one play to snare the ball with her fingertips and spin it between a pair of RedHawks who both swung and whiffed. The final frame offered Trujillo and Emma Mathusek a chance to shine at the service line. Trujillo ripped off four straight serves on which the RedHawks managed to touch (not return) just one, then Mathusek, the hardest-working libero in the biz, got a bit of sweet reward for all her digs and floor burns. Given the ball and free reign at the line for the first time this season, Mathusek fired off a truly nasty ace which ripped a hole in the court, then her second serve set up Trujillo for a tip winner which froze the defense. While few of the Wolves spent their usual amount of time on the floor, Toomey-Stout nailed a match-high 12 kills and collected five digs. Scout Smith, showing off her rapidly-expanding repertoire of sets (including a fair amount of set-ups created while bounding skyward), collected 16 assists to go with five service aces. Menges (seven aces), Mathusek (six digs), Prescott (four digs), Emma Smith (three kills) and Trujillo (three aces) all chipped in to crafting an extremely-balanced stat sheet.